Hi I'm Denise, also known as Neecie and I'm the creator of Adair's and Neecie's Treats. I've always enjoyed making decadent, mouth watering food, and have developed my skills, education and experience over time. in this Toronto, Ontario kitchen. Peanut Butter Cookies. Was I little, or what? My Grandmother Rason was also a loving and great inspiration to me. I spent many hours in the kitchen with her back in my formative years. 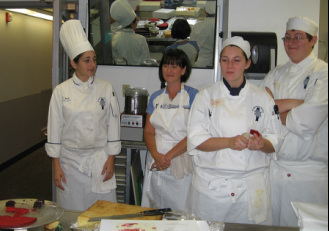 I truly enjoyed attending the occasional Pittsburgh Culinary Institute Enthusiast class. I've continued my ongoing cake and patisserie education since the 1980's. Graduated with honours in Georgian College's premier Baking and Pastry Arts Program.